The latest direct-to-DVD from Provident Films is Ring the Bell. 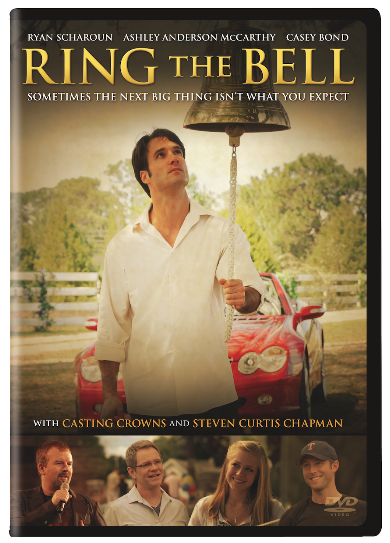 This family friendly film about love, faith, forgiveness…and baseball takes place in the small town of Middletown, a rural, all-American country town full of faith in God and the love of baseball. When fast talking sports agent Rob Decker comes to town to try to sign the town’s high school baseball phenom to a big league contract, he meets several townsfolk who live out their faith daily and aren’t persuaded by multi-million dollar signing bonuses and challenge Rob’s entire reason for living. The story is poignant, albeit predictable, and the singers and sports stars are better actors than the bulk of the cast. That being said, this isn’t a big budget film and it is worthy of family movie night viewing. The message of God’s redemptive love and of being a good steward of the life God gave you come through loud and clear and are well woven throughout the movie. I LOVE Steven Curtis Chapman’s character, Pastor Steve-he reminds me a lot of my own pastor. One lucky reader of The Mom Maven will win their own copy of Ring the Bell. US entries only. The winner will be chosen via Rafflecopter and notified by email. the winner has 48 hours to claim their prize. The giveaway ends at 12:00am on 5/18/13. I DON’T KNOW ANY BECAUSE I DON’T FOLLOW BASEBALL. Josh Hamilton is my favorite baseball player! From way back – Mickey Mantle!